Transportation Costs > How Much Does an Airstream Cost? How Much Does an Airstream Cost? 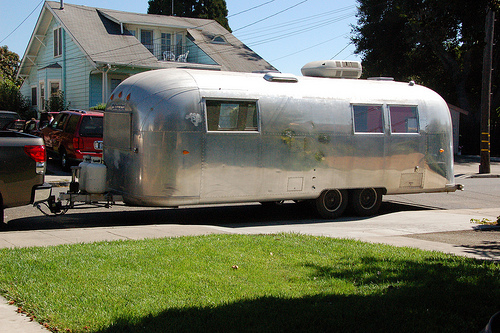 Dating back to as far back as 1930, Airstream is most notably known for its rounded aluminum shaped bodies. These were actually designed for people to live in, but some people now use them as a camper instead. One model is even known as a “land yacht,” showing just how well-made and luxurious they can be. Some of the other types of Airstream trailers include the International Sterling, the International Signature, the International Serenity, the Eddie Bauer, the Sport, the Flying Cloud, and the Classic. Like any other RV, the cost of an Airstream will depend on the model, size, features added, the condition and dealer/seller. On average, brand new Airstream trailers range anywhere from $35,000 to more than $150,000 as a base price. Of course, these prices can greatly increase as you add premium options. As for used models, the costs will depend on the condition, the exact model, the features and who you’re purchasing from. From what we saw, a used Airstream in great condition could cost anywhere from little as $11,500 for a 1977 model to as much as $110,000 for a model younger than two years. NOTE: Again, these are the price ranges for a used model, and the price range will be dependent upon the condition, seller and features added. For example, RVTrader.com has a variety of Airstreams ranging from as little as $9,500 to as much as $105,000. Created from a heavy aluminum, most Airstream trailers are going to be 22 to 31 feet long. Depending on the model, the average weights can be between 4,500 and 8,800 pounds. Because the Airstream is made from aluminum, 99 percent of the trailers on the road will be silver. Most Airstream trailers sleep four to six people comfortably, and standard features in most basic units will include aluminum wheels, a white aluminum finish on the roof, solar gray windows, front and rear access door, dinette area, bedroom and/or twin beds, living room, and bathroom. Over time, repairs will be required. One common repair, according to many owners, is when the clear coat that is painted over the aluminum starts to peel. If this happens, the entire Airstream will have to be buffed, polished and recoated. Another common repair are dents since the aluminum frame is prone to denting. Lastly, leaks are notorious in most Airstreams. If the seams are not sealed every few months, the sealant will dry out and the cracks will start to build up with water, causing the leaks. Common repairs can range from $50 to as much as $900 depending on the repair. Be careful when purchasing an older Airstream. Many owners have claimed that it has been hard to replacement parts, especially on the older models.